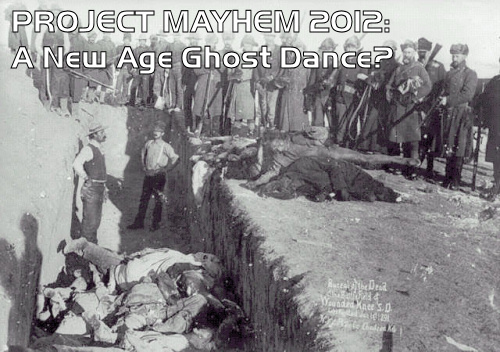 Home > Corporate Greed, Kleptocracy	> Project Mayhem 2012: Re-Evolution Or New Age Ghost Dance? “Natdia” was a Native American spiritual movement that came about in the late 1880s, when living conditions were deplorable on Indian reservations and the People needed something to give them hope. Central to the religion was the “Ghost Dance”, which they believed would bring about the renewal of their society and the removal of the fork-tongued Whites. The Lakota Sioux took it one step further, making “Ghost Shirts” which they believed would protect them from the soldiers’ bullets. Their great chief Sitting Bull was soon after killed by tribal police sent to stop the Ghost Dancing. Then at Wounded Knee South Dakota on 29 December 1890, the United States Cavalry fatally riddled the Ghost Shirts of more than 200 cold and starving Sioux warriors, women and children with thousands of rounds of hot lead, ending forever the Ghost Dancing and all hopes of returning to a once noble, free and natural existence. Flash forward 122 years to December 2012: The end of the trail of tears leading from personal freedom to global fascism draws near, but an end to the suffering of the People at the hands of their fork-tongued masters is nowhere in sight. Could “Project Mayhem 2012” bring about a social “re-evolution” as promised? Or is it just another New Age Ghost Dance? To poet activist Alice Connally Fisk for inspiring this research. Multi-Chem & The Insanity Of Letting The Frackers Do It Again Who Benefits from Obamacare? Democrats, Republicans & the Corporations that Control Both Parties.